"I AM Bringing Down Kingdoms of This World to Raise Up My Kingdom"
"I Am Bringing Down the Kingdoms of This World to Raise Up My Kingdom"
The Kingdom of the World has Become the Kingdom of Our Lord! On a recent morning I was awakened with this word from the Lord: "I am ready to do what seems impossible in this moment of your history. Kingdoms of strength and stature will begin to collapse before your eyes to make way for the unveiling of My Kingdom purpose and plan. You have entered a moment of significant cultural transformation in the kingdoms of the earth." We have stepped into a moment of history when we will see a visible demonstration of the verse that announces the conclusion of all things, "The kingdom of the world has become the Kingdom of our Lord and of His Christ..." (Revelation 11:15). Kingdoms and systems in places of power in the earth that seem large and immovable to the natural eye will begin to collapse as we watch the process of Kingdom transformation taking place before our very eyes. In the Book of Acts we read that the false god, Artemis, was worshipped by the entire city of Ephesus. History tells us the Temple of Artemis was one of the most magnificent structures in the known world. Historically, it was known as one of the Seven Wonders of the Ancient World. When it was constructed, 127 ornate columns surrounded the temple. Each of these columns was an individual work of art. The columns were gifts sent by some of the most powerful kingdoms on earth at the time to declare their allegiance to the goddess Artemis. In Acts 19 we read of the power encounters Paul had during his visit to Ephesus, "God was performing extraordinary miracles by the hands of Paul, so that handkerchiefs or aprons were even carried from his body to the sick, and the diseases left them and the evil spirits went out." Later, in the same chapter, we see the evidence of these God-encounters with the spirits of darkness. Satan's hold on the culture was being pried open and forced to release those held captive to His deception. The text in Acts 19 goes on to say, "Many also of those who had believed kept coming, confessing and disclosing their practices. And many of those who practiced magic brought their books together and began burning them in the sight of everyone; and they counted up the price of them and found it fifty thousand pieces of silver. So the word of the Lord was growing mightily and prevailing." The influence of Hell over the region was being threatened because light was displacing darkness, and the results of that displacement were people being set free. As this freedom was taking place, a local silversmith named Demetrius created great opposition against Paul's ministry because it was taking business away from him and the other craftsmen who made their living creating articles used to worship Artemis. A riot ensued, but the process of deliverance had already been set in motion and would lead to the eventual demise of this powerful spiritual influence. Over the course of the following centuries, the repeated prayers of the Church and the repeated confrontations with the spirit of Artemis slowly began to erode the powerbase of this false god. One historical document tells of a disciple who entered the temple and uttered a prayer of rebuke confronting the demonic powers that occupied the temple and influenced the region. At that rebuke, the altar of Artemis split apart and the temple structure began to collapse. Upon seeing the hand of God move with such authority, the record tells us the people of the city began to weep and pray. Because of that demonstration of God's power, a revival broke out in Ephesus. 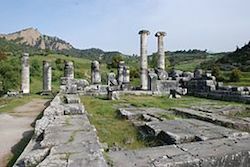 The temple began to collapse when the accumulated prayers of the Believers who had come before reached a critical mass and joined with the timing of God for the final dismantling of the Temple of Artemis. Today, there only remains a decaying portion of the original foundation and bits of scattered archaeological evidence that the Temple of Artemis ever existed. God's work was devastating and complete. "Get Ready! I Will Amaze You with My Transforming Power"
"Some of you have been assigned to bring a single word that will be the final punctuation mark placed on a long sentence of spiritual warfare. You will speak this final word and a kingdom will fall in a day. It is not for you to know which of you will bring this word. Your assignment is to speak in obedience. I will do this work - I will perform My Word. I will amaze you with My transforming power." This is a moment in history when your prayers and prophetic declarations carry unique significance. The accumulated prayers and declarations in the history of those who came before you are joining with your word of faith. The union of these prayers and declarations will release tremendous and unexpected change on the face of the earth. The people in our cities will begin to weep and pray as they did in Ephesus because they will have witnessed the God of Heaven dismantling the powers of a lesser kingdom. Great revival will be released when we see these visible demonstrations of power that will begin to transform the kingdoms of this world into the Kingdom of our God.